As devout Methodists, my great-grandparents Charles and Permelia Nelson Pearce paid homage to the founder of their denomination in the Christian faith, John Wesley (1703-1791), when on January 17, 1876 their third son and seventh child was born and given the name “Wesley,” originally from the Old English that means “one from the west meadow.” This seems even more appropriate when we know that his future occupation was to be farming in America, even if his Grandfather Richard had chosen the eastern side of Pine creek because of the mill site. To our knowledge, my grandfather was the only person in either the Pearce or Austen families given that name. Others, however, did carry his middle name, Herron, possibly after the Presbyterian preacher from First church, Pittsburgh, who was also serving the nearby Cross Roads Church when it was established in 1826. Wesley, his wife, one of his children and his wife (Dale and Helen), his parents and grandparents are all laid to rest at Cross Roads Cemetery, though most at one time or other belonged to Salem Methodist Church. Ironically, Herron was also the surname of one of the Allegheny County commissioners who, through the right of eminent domain, evicted Wesley and his family from the Pearce homestead along Pine Creek in 1927 [see previous story]. 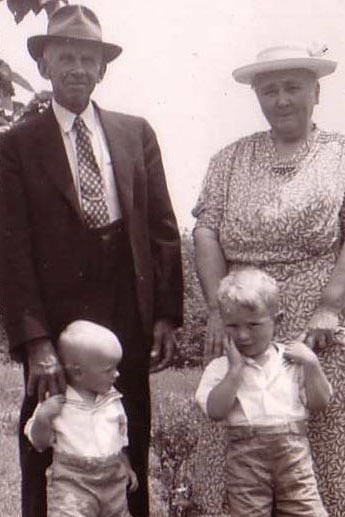 Born in the middle of winter in a year that witnessed the centennial celebration of the United States, Wesley must have been welcomed by his parents for several reasons: first, sons were always needed to help with the farm work, and second, winter was a good time to deliver children. Extra work around the farm was at a minimum, especially for the women. Wesley’s mother, Permelia, probably had lots of help in the house, with many relatives nearby. His father Charles Pearce had nine older siblings, eight of whom were still living. Three of Wesley’s four older sisters were still living, with Permelia (the daughter, age 13) the most helpful. Bertha Susan had died (age 3, see a previous article) and Addie (9) and Minnie (4) were probably too young to do much except keep each other company. Brother Albert (16) was very helpful around the barn, but Edward (6) couldn’t do much yet either. Wesley’s father and mother both died within four days of each other in 1914. A newspaper account suggests that one died of a broken heart upon the loss of the other, but my father, Ralph, says that they each had pneumonia to begin with, and the deadly disease only got worse when wife Permelia attended Charles’ committal in a cold rain. He was in his 80th year and she was in her 75th. Charles had been a school director, church trustee, and owner/operator of the Pearce Milling Company and farm. So, the Pine Creek farm went to Wesley, who had always worked alongside his father and showed a deep interest in it. The mill went to Wilbert, Wesley’s younger brother by four years. Wesley was a hard worker, and maybe a little bit shy, with little time for socializing. But, when he was about 35, he became attracted to a girl who lived just up over the hill. Ironically, her family name was “Hill,” and she also was the prim and proper product of English settlers dating back to the early 18th century [probably the earliest was tavern owner and our centogenarian Henry Moon (1718-1825)]. Her grandfather, John D. Hill (1824-1915) had been a Captain in the Civil War and was awarded enough land to give each of his sons farms in nearby southern Butler County, very close to where Bessie and her husband would relocate after the establishment of North Park. My grandmother Bessie was 11 years younger than Grandfather Wesley when they were married on May 18, 1910. With most of the other offspring married and moved away, except Wilbert who lived next door to the mill and Edward who had a farm adjacent to the homestead, the newlyweds moved into the big farmhouse. Wesley’s parents had moved in with a daughter down the road shortly before their deaths. 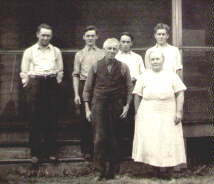 The marriage of Wesley and Bessie produced four sons within seven years: Walter (1911), Howard (1914), Ralph (1917), and Dale (1918) [see future articles on their families]. Our past story was devoted to the farm at Pine Creek and the necessity of moving to a new farm when Allegheny County took over the property under the right of eminent domain to establish the public entity known as North Park in 1927. The new farm was located just off Three Degree Road northeast of Mars. Three Degree today runs north-south, perpendicular to State Route 228, between the area high school and middle school, past several of the old Hill family farms, and towards North Park. Surrounded by neighboring family farms belonging to Parks, Coopers, Tindalls, and Grubbs, a cousin to my dad, the Pearce operation then had a moderately-sized white, wooden two-story farm house, L-shaped barn (unpainted, at least in the mid-1950s, as I recall), chicken house, spring house, and several out buildings. Electricity wasn’t introduced to this part of the county until the early 1930s, and running water was in the form of a “pitcher” pump in the pantry. Saturday night baths were taken in a large tub in the kitchen or pantry with water heated on the wood/coal stove. I can still see Grandpap’s razor strap hanging beside the pantry sink and mirror. Unlike his father, Charles, Wesley was always clean-shaven. My dad insists that his father was strict, but he doesn’t remember ever being disciplined with that razor strap. According to my dad, the Pearces never had more than 10-12 cows, and they were all milked twice a day by hand. The milk was taken to the end of the lane once a day for pickup in five metal jugs. Another set of clean cans containing the Pearce name was returned at that time. 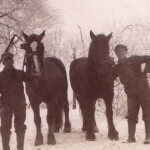 When the family first moved to the farm near Mars, the fieldwork was done by a team of “matched” horses named Clyde and Maude, very similar to Clydesdales or Belgium Drafts. When working, and a turn was required, the one on the inside knew to take smaller steps and wait for the other to get around. The boys loved those animals, but one morning, unfortunately, Maude was found lying in her stall with her hip broken. She had somehow caught her leg in a rope and fallen. She had to be put down. That was a very sad and costly day on the Pearce farm. Eventually, trucks and tractors took over for the horses and wagons. My father Ralph loved to talk about the farming experience he had with his dad. He remembers some of the most interesting things: Wesley never weighed more than 135 pounds in his life. Even in the hottest weather, when working in the fields, his dad didn’t drink water, but he wore “long underwear” to soak up the sweat and keep himself cool. Yet, the only time his father saw a doctor was one time when he had a large, painful carbuncle under his arm. This tough lifestyle apparently suited him well because, like his father before him, Wesley died in his 80th year. I remember my grandfather as a very handsome man, even though I was only seven years old when he died. Today, our old pictures from various family functions confirm that. Wesley had a slight build, but was always tanned from working outdoors, a stark contrast to his white shirt and tie. He was a Charlton Heston-type with high cheek bones and lots of character lines, and, like my dad, had white hair that had turned from very dark relatively early in life. He seemed to have had a quiet demeanor, except as I recall, when he and Grandma had to babysit my sister Ellen and me. He didn’t like us playing on the stairs or “roughhousing” on the furniture. Grandma would calm him down in her soft-spoken way. She outlived him by almost 20 years (1887-1974) and died at the age of 86. She moved to an apartment in Butler after the farm was sold in 1957, to be halfway between her Pennsylvania sons, Ralph and Dale. She was active until the end: attending church, reading, and writing letters. My silly childhood memories are of her overuse of bluing on her hair, her black orthopedic shoes with two-inch heels, and Christmas gifts of $1 bills to all the 15 grandchildren. I never saw her wear anything but a dress, whether working, worshipping, or attending picnics. I wish I had taken the time to know her better. I’d have lots of questions for her today! The farm near Mars, Butler County, represented a sizeable increase in acreage for Wesley. North Park had taken 100 acres, but the new farm was 165 acres. My dad recalls that his father paid $13,000 for it, and when it was sold 30 years later to a large corporate operation with offices in Pittsburgh, Bessie received $22,500 before expenses [Wesley’s sons Walter and Howard had each received property as living inheritances, thus reducing the farm to about 135 acres – see future articles]. The Springhill Farm, as the organization was called, was owned by Joseph M. Taylor and raised polled Herefords. Taylor’s son became the operator. More than a decade ago, the farm was sold again. The old wooden farmhouse was torn down, and in its place today stands a magnificent modern family dwelling worth well over a quarter-million dollars. The old barn is gone too, but nearby is a grand horse stable with indoor riding arena. The springhouse, which separated Grandpap’s house and barn, is still there however, having been completely restored and probably still used. Some of the pasture is still cut for hay, but at least 10 new houses have been constructed along Pearce Road. I can only imagine how much the total worth of the Pearce property has increased over the years. None of Wesley and Bessie’s sons chose to continue farming. Walter (1911-1997) got a job in the steel mill during the war years, but stayed with his new wife and growing family in the house he’d built on the property his father had given him. In 1973 he retired to Florida. Howard (1914-1990) built several houses on his parcel, maintained a large chicken business, and started a family before moving to California and then to Florida. Ralph (1917-2002) worked for the telephone company, married, and settled along Route 8 not far from the farm. 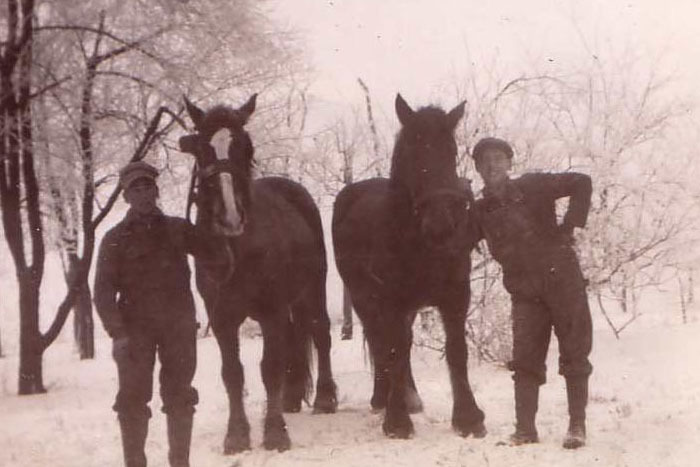 These three sons all had exemptions from military service because of their occupations. Ironically, Dale (1918-81), the youngest and the only one to attend college and teach school, was drafted and served in the Army Air Corps during the war. He married and settled in Grove City, PA, rising to the office of public school superintendent. Hello my name is Dana and I live in the house that Howard built on Pearce road. I am so glad that I found this article. I grew up in this house and am so glad to finally know the interesting history! I am now raising my children in it and will tell them the history of tis house too! I’m glad you found the website. I’ll be visiting Howard’s family this summer. Hope you will look around for more Mars/Middlesex stories. Do you know any of the families mentioned? Tell your friends about us. My grandfather was Joseph M Taylor and my father his son was Henry G Taylor. I lived at Springhill Farm in the early 50’s. I cut my teeth playing in the barn and remember the springhouse and its watercress. I assume you’re referring to playing at the Pearce Farm near Mars? I did too. Where was the Springhill Farm? Did you attend Adams Twp. Elementary and Mars? Where are you now?I attended Middlesex but moved away before high school. I still have family in that area. You must have known my Uncle Walter and cousins Alice, Joyce, and Chuck who lived at the end of Pearce Lane. Sorry, I don’t remember any Taylors. Thanks for responding. The Taylor Family was associated and in business with the Ball Brothers and shared their hobby of polled Herefords. Springhill had two farm operations and my family lived on the smaller 2 bedroom farm with a large pond full of turtles and a nice spring house with water cress ,off what my dad called the new red dog road which I assumed referred to the sort of gravel on it. We left for Arizona well before my school years but I retain very vivid memories of the old place and can still draw the floor plan. Just been reading this article. It is a great history. I am not sure if I am related or not. I live in Wales in the United Kingdom. I will find more information about my background. It is truly an honour to know another Pearce in another country. Best regards to you all ….